So I did say a few blog entries ago that I was over making soup for a while, but when I was perusing the latest edition of the lovely Gourmet Traveler magazine at my hotel on my latest trip to Melbourne, this recipe just jumped out at me and I couldn’t resist. I have been in desperate need of a nice healthy lunch (well, multiple healthy lunches, really), so I decided to make a batch of this and have dinner at home for once and have leftovers for lunches. The great thing about soup in general is it freezes really well, so I made this one week and froze most of it in individual containers so I could have lunches the following week. The differentiating factor in this soup is definitely the hefty lemon boost. It uses the juice of a whole lemon and the grated zest of it as well, so it tastes delightfully citrus-y. I also love the idea of putting the shaved parmesan in the soup so its flavour seeps throughout the soup and even thickens the broth a bit. 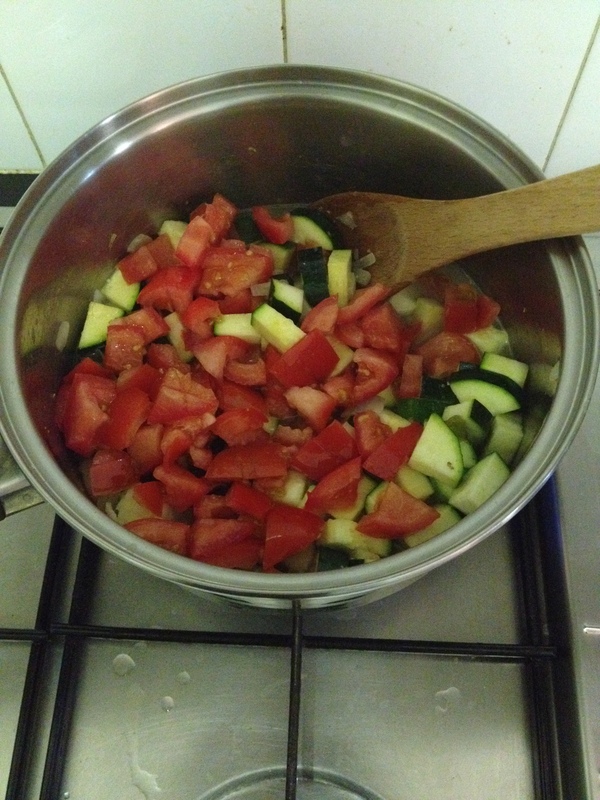 When you’re making it, ensure that you add the zucchini and tomatoes together when the onion is essentially already tender because I was surprised by just how little time it took for them to cook. And no one likes soggy zucchini. I purposely went to the store to get all the ingredients for this and then forgot frozen peas and was really annoyed, but the soup tasted fine without them. I added in more cabbage to compensate as I’d gotten it from a bag. (I highly recommend you get pre shaved cabbage unless you want to chop/shred a whole head of cabbage.) I’m sure the soup would taste even better with the frozen peas though and it would add another layer of lovely green texture. I also like the addition of the fresh herbs at the end – I only used basil but definitely the more fresh herbs, the better! Heat a bit of olive oil in a saucepan or spray with non-stick spray. 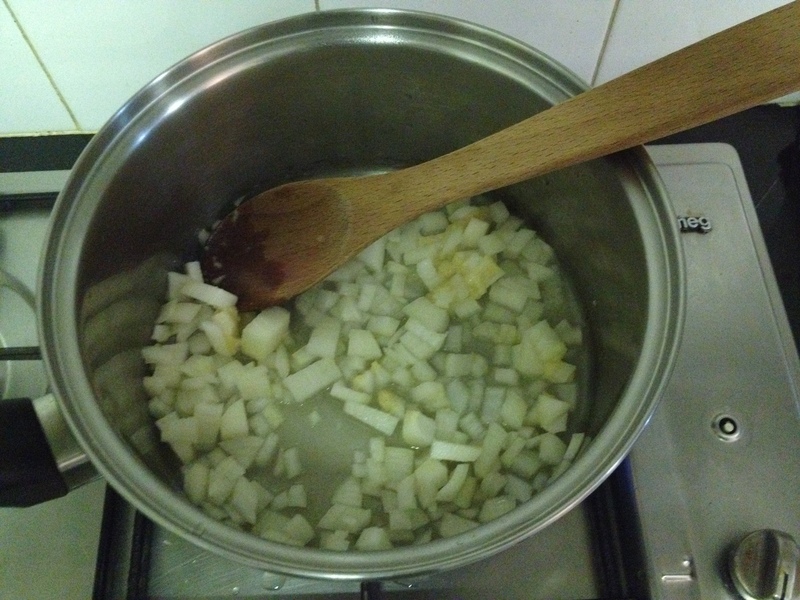 Add the onion and garlic and saute until they’re tender (5-7 minutes). I used non-stick spray so had to add a splash of broth every once in a while to make sure they didn’t stick to the pan. 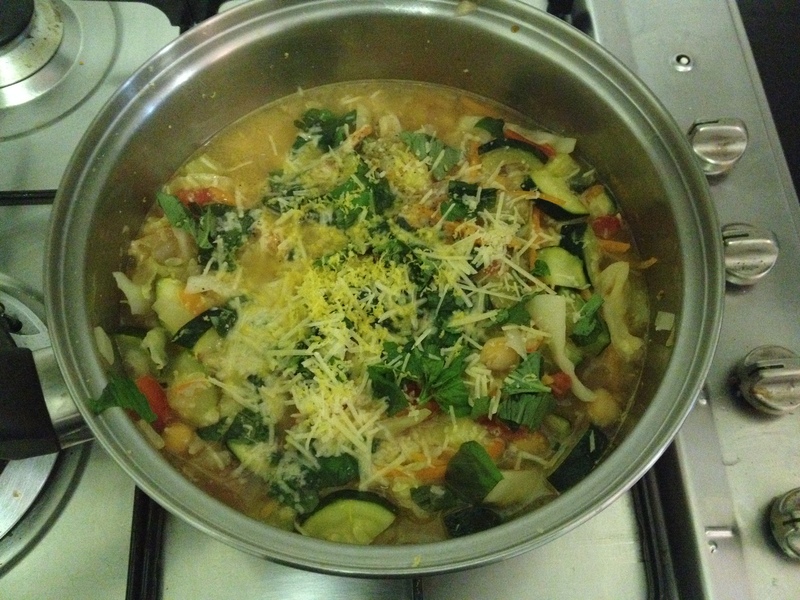 Add the zucchini and tomatoes, stir to coat, and then add the stock, chickpeas, and parmesan rind if using. (I just got some grated parmesan in a bag so didn’t have a rind). Keep the broth on a simmer as the zucchini cooks pretty quickly. When the veggies are almost tender, add the cabbage and peas, wait a minute or two, and then add your grated parmesan. Add some salt and pepper to taste. Remove from the heat, add the lemon rind and juice, and top with basil and mint to serve. And finally you sprinkle the whole combo of stuff with parmesan and fresh herbs and you are ready to go. Yum. This soup was so delicious and so simple to make. It’s rare that I see a recipe in a magazine (particularly any Food and Wine esque magazine where all the recipes are crazy complicated and mostly very unhealthy) and want to immediately make it, but I made this probably about two days after seeing it because it was just calling to me. I think this would be a lovely spring or autumn soup, so it actually fits quite well with Australia going into autumn and America going into spring (with the occasional snow of course). It would be great for a dinner for multiple people served with fresh foccacia. Or, you can just freeze it or put it in the fridge in individual portions and keep it all for yourself!